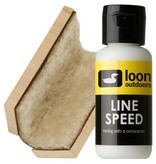 Loon Line Up Kit includes Line Speed and Line Cleaning Tool for the ultimate in fly line cleaning. Apply desired amount to Line Cleaning Tool. Use Line Cleaning tool to apply to entire fly line. Let fly line sit overnight. Buff line with cloth to remove excess Line Speed.